I've fallen in love. It was breathtaking, instantaneous and unplanned. It took just one look, and I was gone. 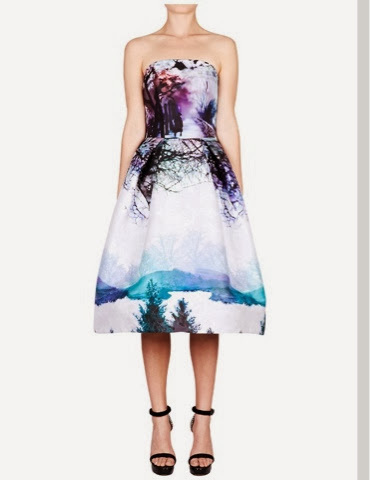 Ok, maybe that's a little dramatic, but I do believe in love at first sight, and this was definitely what happened when I saw this gorgeous Mary Katrantzou dress in the window of Green With Envy the other day. Isn't it gorgeous? 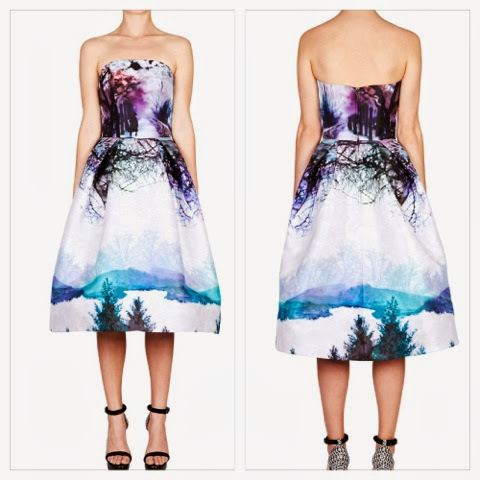 I absolutely love the inky indigo winter graphic print, and it's so unusual to see such a design on a ball gown. The boned bodice and wide skirt hark back to a glamorous, feminine period but with a totally modern print. Imagine wearing it to a masquerade ball, or really standing out at a formal event. Unfortunately, I do not have invitations to either of those things. Even the next best event, my 21st, is two years away. I am also not currently in possession of $3,370, which is what this beauty will set me back. Sigh. Onto the 'I Wish' list.